December 12, 1969. Milan, Italy. 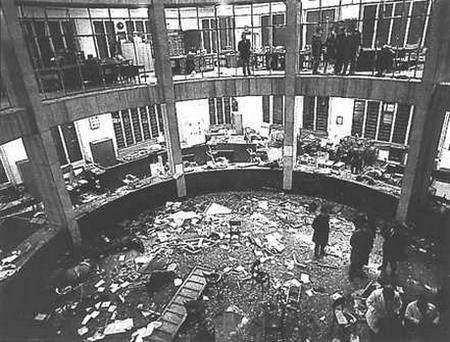 A bomb detonates at the National Agrarian Bank. At the time, the attacks were believed to have been the work of radical left-wing communists who had developed traction amongst students and laborers with the largely peaceful Autonomist movement. In actuality, the bombing was the work of fascists on the right, meant to fool the public into thinking that the leftist workers were behind the attacks thus extinguishing any further growth for their movement. 17 people were killed. 88 were injured.